A GARDA ERROR led to almost 15,000 people having a penalty imposed on them by the courts when they should never have been summonsed in the firstplace. 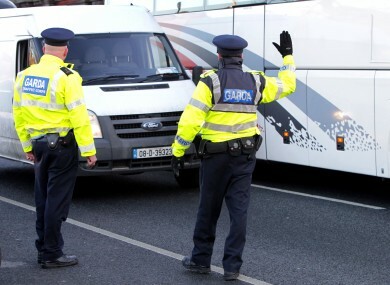 Today, as garda management revealed officers had recorded almost one million more breath tests than they actually carried out, they also disclosed that some 146,856 summonses were wrongly issued to drivers. In 14,700 cases, a penalty was imposed and gardaí are now working to have these convictions quashed in the courts. The issue was first brought to light in April last year when a driver was summonsed to court for no NCT certificate. It transpired this man had already paid a fixed notice charge and An Garda Síochána launched a review to establish how it happened. Since December 2014, no summons should be issued for failure to have an NCT certificate unless the driver has first been issued with a fixed notice charge and then failed to pay the charge. An initial examination of all fixed charge offences indicated that in 1,130 cases, a notice had been issued and paid but the person was still summonsed. However, a further analysis of the fixed charge penalty system between January 2006 and May 2016 revealed there were 146, 686 people between January 2006 and May 2016 brought before the court without having ever received a notice and therefore an opportunity to pay the fine. An estimated 96% of cases relate to people who had multiple offences before the court. The remaining 4% – around 5,860 people – were summonsed to court solely for that one offence. Around 10% of the total, or 14,700, had penalties imposed on them in the courts. Assistant Commissioner Michael Finn today told reporters that An Garda Síochána is now appealing those outcomes in the circuit court. “This was an error on our behalf in how we processed these cases. We have identified it and we have put an IT upgrade in place to ensure it’s not repeated again,” he said. I apologise to all those people we brought before the court who should have been given an opportunity to pay a fixed charge notice. It’s our mistake and we will rectify it. An IT system that prevents summonses being created in these circumstances has now been rolled out to prevent this from happening again. He said gardaí will be writing to each of the people affected to explain what happened and how they propose to rectify the situation. Any fines imposed will be reimbursed and any records involved will be corrected. When asked whether there had been consequences for these drivers in relation to insurance costs, penalty points or other financial costs: “That is a possibility in some of the cases”. He said it was also a possibility that these people could take legal action against the State. Email “Garda errors led to thousands of drivers being wrongly convicted ”. Feedback on “Garda errors led to thousands of drivers being wrongly convicted ”.